The Zephir DM lidar has been installed on the prototype in Dafeng, Jiangsu province, eastern China. It will be used to help DNV GL verify the turbine before being used in a programme to aid lidar-assisted control, Zephir said. 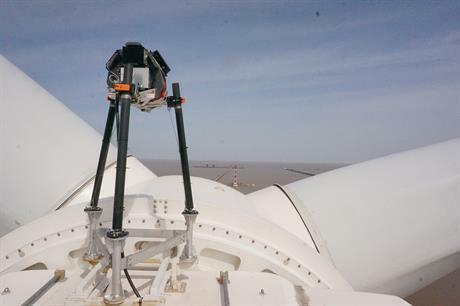 The lidar will measure the wind before it hits the turbine, allowing it to react, ensuring the turbine is at the optimum pitch and angle as early as possible. According to Zephir, the lidar will help Goldwind optimise the prototype turbine before it enters mass production. It measures power curves and helps to understand the effects of wind flow propagation on the turbine's performance, it said. Goldwind's direct-drive turbine has a rotor diameter of 150 metres and is an upgrade from its 5MW turbine. The prototype has been installed for just over two years. In December, Goldwind president Wang Haibo told Windpower Monthly: "Offshore wind is the future. Goldwind's strategy is to push it forward actively and steadily. In the coming five years, we'll keep developing offshore products, progressing steadily in technical reserve and prototype installation and testing. We will not bring the turbine to market in a hurry."